"There has never been anything like what I have become." The One is the most irritating kind of science fiction film. It has a great premise, a decent director, and a budget big enough to create a dynamic visual world. Irritating, then, that the premise is wasted, buried under innumerable fight scenes; that the director flounders in capturing a consistent tone or in creating any real sense of urgency; and that the special effects are, more often than not, readily apparent and hokey. It's not a total wash�martial arts fans can look forward to several fairly dynamic fight scenes, and at a running time of barely 80 minutes sans credits, the repetitive plot doesn't have much chance to get bogged down.Jet Li has made a couple of big budget American films in the last few years, and he has yet to make a good one. This time, he takes on several different roles, as the plot deals extensively with alternate universes. In one, Li is Yu-Law, a villain with the ability to travel between dimensions. He discovers that if one of his other selves is killed, the power spreads to the survivors. He decides to go on a killing-spree, systematically killing "himselves" and becoming more powerful all the time. Two vaguely defined time cops (played by Delroy Lindo and Jason Statham) follow Li to our universe, where the last remaining alternate lives and works as a policeman. They must help him to survive, since no one knows what will happen if someone becomes... the One! There are fears�he may implode, or explode, or become a god. I say, as long as it ends the movie, any of the three is fine with me.The plot as described above is basically the whole movie. There is little character development, or even story development. The basic premise is outlined in heavy-handed opening narration, but otherwise, the concepts at the core of the film are never explored. Yu-Law and the two officers seem to come from some future time, but how does a future so advanced fit within the outlined "multiverse?" Shouldn't they all be roughly equivalent? I don't need all of this stuff to be plausible, but I'd like some explanation. There's the usual romantic subplot, which totally wastes Carla Gugino, but I'll say one thing about it�it's so bad it almost vaults the film into camp territory. Only almost. There's also the problem of the action scenes. The One as originally conceived was to be a throwback to traditional action pictures, shunning the influence of The Matrix. But when the original star, The Rock, passed on the film and Jet Li stepped in, that all went out the window. Now, the fight scenes are all martial arts, and most of them use the same slow-motion techniques that have become all too familiar in recent years. That's not to say they aren't interesting�I did like one scene, where Yu-Law takes down four men in the time it takes one to hit the ground�but they aren't very inventive overall, and they quickly become repetitive. The constant rap-metal soundtrack doesn't help, and every action scene seems to quickly degenerate into a noisy, incoherent mess.James Wong, who directed the surprisingly effective teen thriller Final Destination, tries his best to craft all of these disparate elements into a exciting action film, but he's less than successful, as the "dramatic" scenes are ludicrous and the action scenes too quickly become dull. Maybe, in an alternate universe, this movie turned out really well. Just not in this one. Image Transfer Review: The One has received a very nice transfer that suffers somewhat from the compression necessary to fit both versions of the film and all of the extras on one DVD-9. Colors come across accurately, reflecting the cool, metallic look the picture had in theaters. Black level is likewise strong, though in some darker scenes, it is hard to make out fine detail. There is a bit of evident edge enhancement, but nothing out of the ordinary. Most problematic is the infrequently visible mosquito noise on hard edges. The print used was in great condition, with no flaws or much grain evident. Audio Transfer Review: The One is sure to please people who like their audio mixes big and flashy. The 5.1 track makes frequent, dynamic use of surrounds, panning, and directional effects. There are also several instances of front to back imaging that are pretty impressive. Dialogue is anchored in the center and is always clean, while the score fills out the front mains. This isn't a subtle mix, but it is fun and perfectly suited to the film. Extras Review: The One has a fairly large collection of extras, but overall, the package feels very slight. There are four documentaries, but they tend to overuse film clips or repeat information. Still, for a movie as inane and inconsequential as this, vapid extras are sort of to be expected.The most substantive extra is the commentary with director James Wong and members of the technical crew, including production designer David Snyder, editor Jim Coblentz, and director of photography Robert McLachlan. Even with a large group, this track is pretty low-energy. The information is consistently focused on the mundane technical matters, though there are a few worthwhile segments covering cuts necessary to get a PG-13 and a funny section at the end where everyone gets real defensive, lashing out against negative critical reviews.The longest of the featurettes is Multiverses Create The One. It runs 18 minutes and focuses on the "science" (right) behind the story, the different theories about parallel worlds, and lots of production details, including the fight scenes, the special effects, the stunts, and the wirework. This piece does a fairly good job of avoiding PR fluff, but there are still too many film clips and sound bites to sustain interest (though there is quite a good amount of making-of too). About Face is more interesting. It runs nearly six minutes and sheds some light on the technical challenges of creating the Li on Li fight scenes, which demanded the actor to interact dynamically with himself. 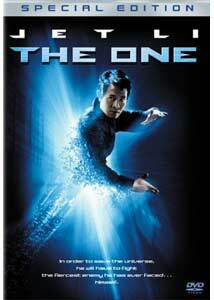 Jet Li is The One is pure PR pap, a 13 minute bit of Jet Li ego-stroking masquerading as a making-of featurette. It also features interviews with the rest of the cast, and they describe the plot and speak a bit about their characters. Finally, there's the brief, amusing The Many Faces of Jet Li, which shows roughly 15 "alternate universions" of Li's character. All told, these featurettes provide little in the way of real making-of material (only About Face has real substance), and they certainly don't merit more than a casual viewing.Also included, aside from the trailer and some brief filmographies, is an animatic to film comparison for the motorcycle sequence. It's actually pretty funny, as the basic shots are acted out with toy dolls. These visual storyboards are much more interesting than the traditional variety, and I appreciate the inclusion.There's a brief easter egg on the on the second page of special features. Highlight the symbol in the middle of the page for a featurette called Mark Borchardt is The One with Jet Li. Borchardt is an independent filmmaker who had a cameo in The One, and this is a funny little interview about his experiences on-set.While there are a lot of extras overall, the grade is a bit low simply because none of the material is particularly interesting (or, if it is, it is of the "watch once" variety). The One is aptly named. It not only describes the central goal of the Jet Li character, it indicates the number of functioning brain cells necessary to enjoy the movie. The script is pretty poor, and the plot is basically non-existent, but for what basically amounts to a live action video game, this is entertaining enough. I know it's clich� to call an action film a no-brainer, but then, there's a reason that certain sayings become clich�.